A powerful, clinically dosed, well balanced pre workout, Previde XP provides intense energy, extreme endurance, and skin splitting pumps perhaps better than any pre workout in the industry. 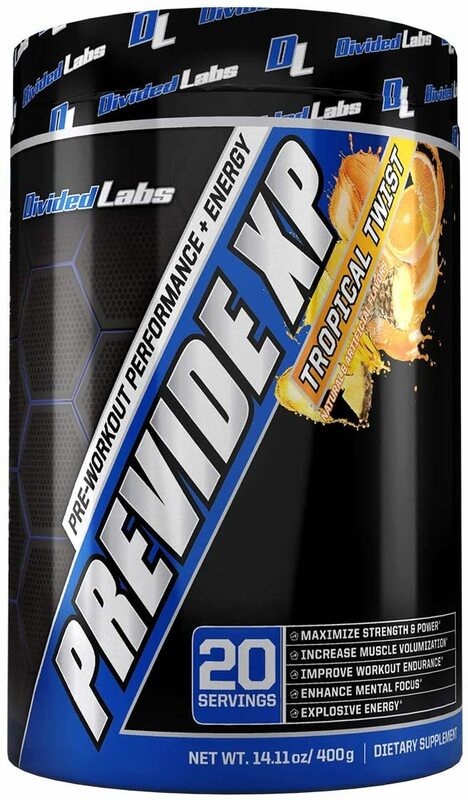 Previde XP contains some of the most innovative ingredients available for pre workouts including Theacrine, Peak ATP, and Hydromax Glycerol. 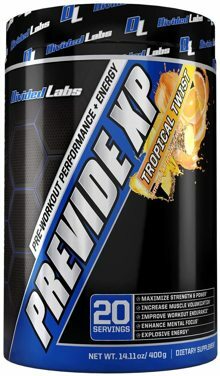 Previde XP continues a tradition of powerful supplements from Divided Labs, one of the premier supplement brands on the market. Caffeine/Theacrine Combo - This combination of ingredients creates an impressive synergy of energy compounds. If 350mg Caffeine wasn't enough, Divided Labs has included an additional 250mg of Theacrine, one of the newest and most innovative energy ingredients on the market. Peak ATP - The neutraceutical version of Adenosine 5 Triphosphate (what humans use for energy), Peak ATP has been shown to improve sports performance after just one dose allowing you to lift heavier, recover faster, and train longer. Citrulline/Hydromax/Agmatine Combo - This trio of clinically dosed supplements features 3 of the best compounds to enhance blood flow and muscle pumps. The combination of the 3 results in improvements in Nitric Oxide production, reduction of Arginase (inhibits Arginine production), and cell volumization.